“Give me twenty-six lead soldiers and I will conquer the world,” wrote Karl Marx. His ideas (however mangled) conquered about half of it. An alphabet army, formed into compelling ideas, is powerful without limit. 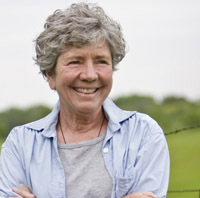 From marine biologist Rachel Carson, who launched an environmental movement with her book Silent Spring, to thousands of citizens leaning into social media to launch Arab Spring, people writing down their thoughts, passions, concerns are changing our world. But The Movement could use more people writing. Each of us has a unique voice that the world needs. 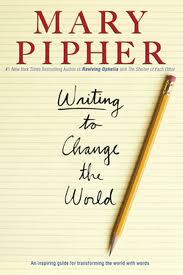 The best guide to help us focus this power is Writing to Change the World by therapist and author Mary Pipher (2006). It’s a great how-to—not so much how to put sentences together, but how to remember that we’re empowered, we’re connected, we have responsibility. Pipher explores with us how to find our own voice, how to grow our soul, how to be honest. She offers insight on the practical aspects of interviewing, organizing, point of view, audience. And Writing to Change the World offers thoughts beyond books or articles: speeches, music and poetry, personal essays and, yes, blogs. The technology exists to solve society’s greatest challenges; it’s affordable; the social infrastructure is in place. What’s lacking most is the groundswell of support to scale up the proven solutions. As a therapist, I usually suggest action…. As change writers, we can offer readers ideas for action. If readers take our advice to work in a soup kitchen for the homeless, they are likely to become more sympathetic toward the poor. We humans are hardwired to care for what we love, but we also come to love what we learn to care for. The truth is, most preaching is to the choir. Choirs produce almost all the important social action in our world. The people most likely to read us are the people who think like we do. And readers generally seek reinforcement of their beliefs, not arguments or challenges. When writing for compatriots, we hope to energize an sustain them. We want to deliver new thoughts and information to them, strengthen their beliefs and mobilize hem to action. Often, we will cite common history and heroes, and employ shared, meaning-laden metaphors. This kind of “to the barricades” writing enjoins communities of believers to make things happen.